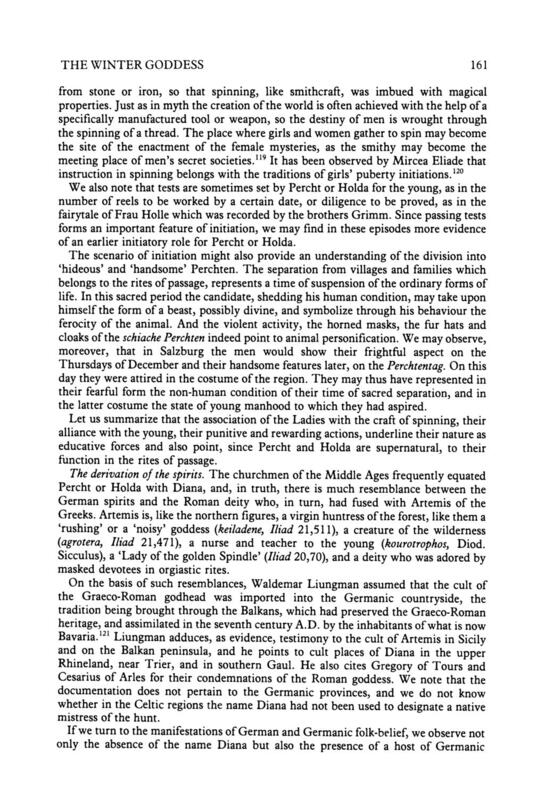 Download "The Winter Goddess: Percht, Holda, and Related Figures"
13 THE WINTER GODDESS 163 spirits, such as Percht and Holda. Animal associations. The linkage with wolves of the northern spirits would find an analogue in the alliance of the German spirits with their dogs. The long or 'iron' nose of Percht and Holda appears to be the vestige of a bird form of the goddess, and the Schnabelpercht possesses, in actuality, a bird's beak. Beaked noses are frequently noted with the northern giantesses, and the giantess Margerdr has an 'iron' nose.129 Some giantesses may assume the shape of birds, and some of these have claws and beaks of 'iron.' 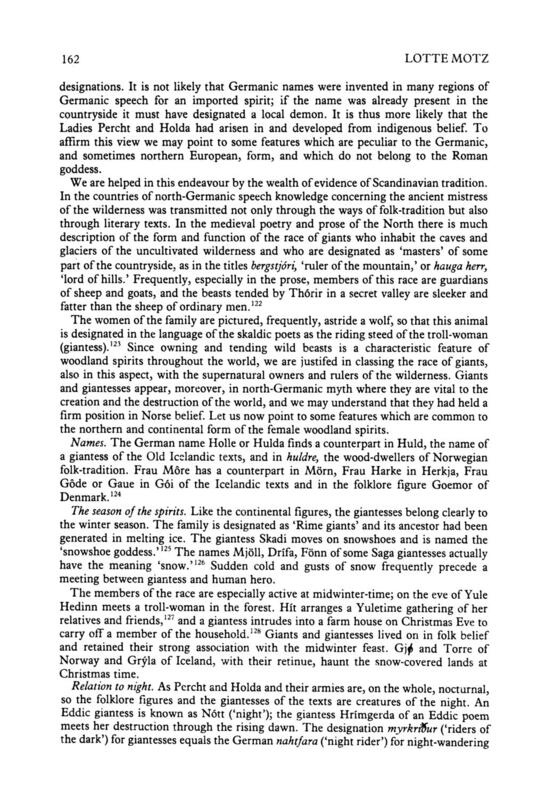 30 The names Geit and Geitla of some giantesses, meaning 'goat' and 'little goat,' point to their association or identity with goats, and we noted the goat form of some German spirits. '31 The giantesses Vargeisa and Hrimgerdr are fitted with some aspects of a horse, and a horse's head belongs also to Stampa of Tyrol. Association with the Wild Hunt. Legends of the Wild Hunt abound above all in areas of Germanic speech; they are told, though less frequently, in provinces once settled by the Celts. '32 We do not meet them, at least not easily, in the Mediterranean regions. Summary. The feasts of the Graeco-Roman goddesses are always celebrated in the spring or summer; the Ladies, usually, are related to the brightness of the day; stags rather than wolves or goats belong with the image of Artemis and of Diana. Though they may lead their nymphs in dance they are not associated with the legend of the Wild Hunt. It is true that in the Middle Ages Diana would preside over nocturnal and forbidden ceremonies; but here we are dealing with a degraded form of the goddess, one who had been turned by Christianity into a witch. 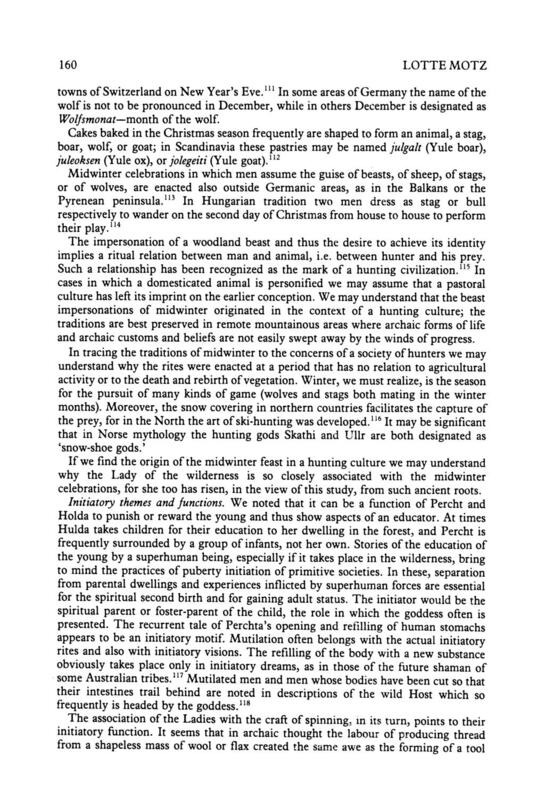 (In Germanic tradition, however, night-time was frequently devoted to religious rites). 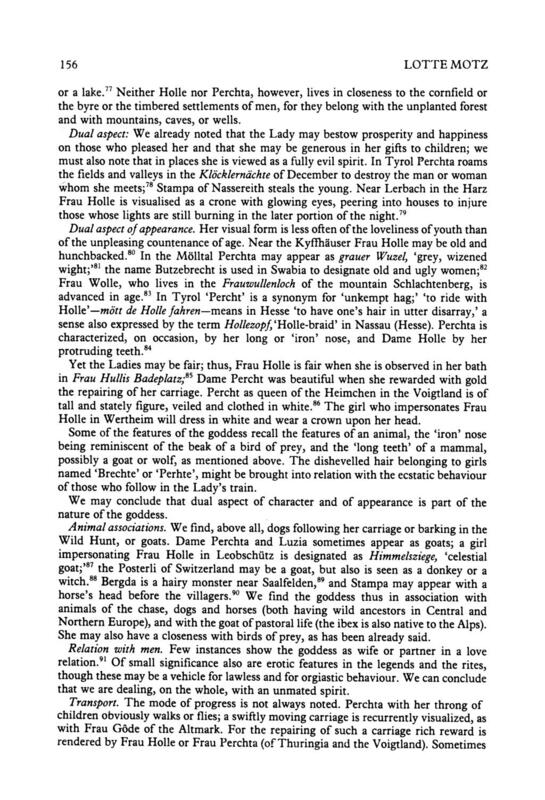 We may understand that, at least in the aspects named above, Percht and Holda share a particularly northern heritage, while of course partaking also of the common features of a Mistress of Wild Things, who represents, as expressed in Der kleine Pauly, the force of nature which is both life-giving and life-taking. NOTES 1. Lotte Motz, 'Sister in the Cave,' Arkiv for nordisk filologi 90 (1980). 2. 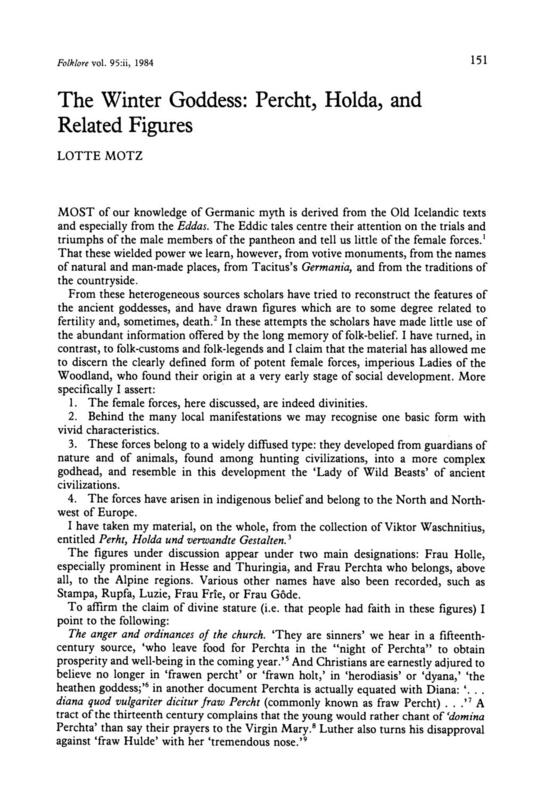 Jan de Vries, Altgermanische Reiigionsgeschichte (Berlin, ); E. O. G. Turville-Petre, Myth and Religion of the North (London, 1964); Brian Branston, Gods of the North (London, n.d.). 3. 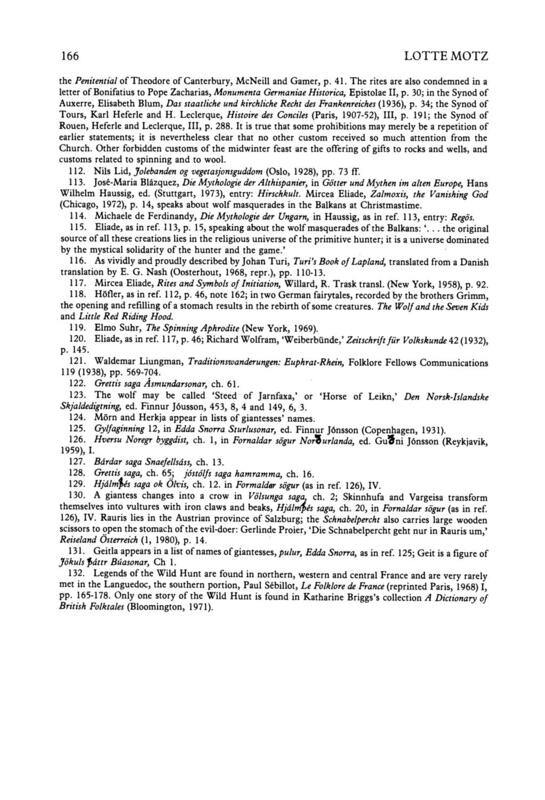 Dr. Viktor Waschnitius, Percht, Holda und verwandte Gestalten, in Akademie der Wissenschaften, Wien, Sitzungsberichte, historisch philosoph. Klasse 174 ( ). References to this work will be marked: Wasch. 4. Perchta is also known in Lower and Middle Franconia; a centre of Frau Holle lore is found in Hasloch on the river Main (Lower Franconia); the centre in Hesse is the mountain Meissner and in Thuringia the H6rselberg. 5. Wasch. 64, quoting: 'der gewissen spiegel.' 6. Wasch. 47, quoting: Stephanus Lanzkrana, Die Hymelstrass (1494). 7. Wasch. 64, quoting: Discipuli Sermones dominicales (fifteenth century). 8. Wasch. 60, quoting: Tractatus de septem vitiis. 9. Martin Luther, Auslegung der Episteln (Basel, 1622), p Wasch Wasch Wasch. 71. 14 164 LOTTE MOTZ 13. Wasch Wasch. 43, in southern Tyrol. 15. Wasch. 65. Frau Perchta especially receives food offerings. 16. Wasch Wasch. 83; the area borders Hesse, Bavaria, and Thuringia. 18. Wasch. 93, in Nassau, Hesse. 19. Wasch Wasch. 81; there is a frauen Hullenbaum near Wertheim and another in the district Tarforst of Lower Franconia. 21. Near the river Main in Lower Franconia, Wasch. 82, and near the Meissner in Hesse, Wasch Wasch. 81, near the Hasloch in Lower Franconia. 23. Wasch Wasch Wasch Wasch. 43, in Lower Austria. 27. Wasch. 80; she may also take them with her in her bag. 28. Wasch. 111, she brings six new undershirts for every child. 29. Wasch. 106, men go into their orchards at this time and promise their fruit trees that Frau Holle will come. 30. In other Tyrolean villages their time is usually Epiphany, Wasch Wasch In Thuringia, Wasch. 108, Fastnachtsdonnerstag. 33. Wasch. 57, in Salzburg; in G6ttingen some of the produce of the field is left for her, Wasch Wasch Wasch Wasch Wasch. 73; the night of the Streggele in Zurich is before Christmas. 38. Wasch. 73; sometimes as many as a hundred young men will band together to draw the Posterli on a sled to the next town. 39. This 'Lady' is clad in fur and wears a terrifying mask. 40. Wasch. 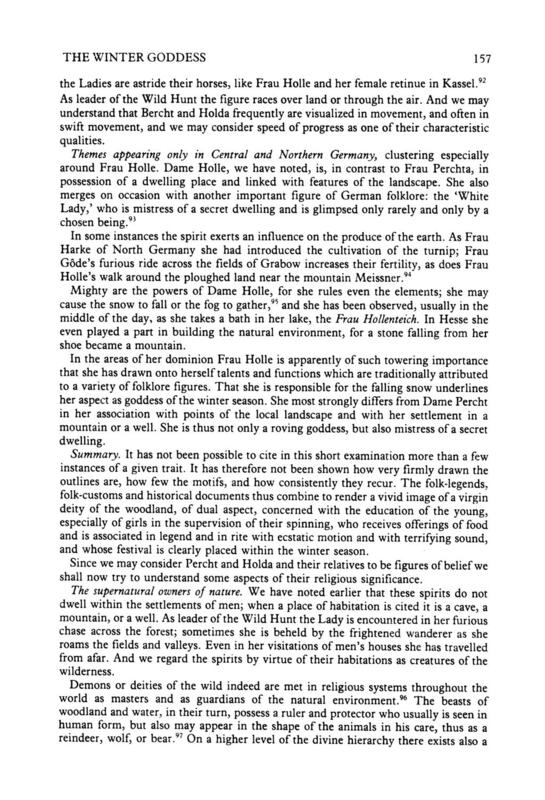 80, 89; Frau Holle leads the hunt in Franconia; in northern parts we find Frau G6de, de Fuik, or de M6re, Wasch. 129, 130, Otto Hofler, Kultische Geheimbtinde der Germanen (Frankfurt, 1934), pp , quoting: Blockesberges Verrichtung. 42. 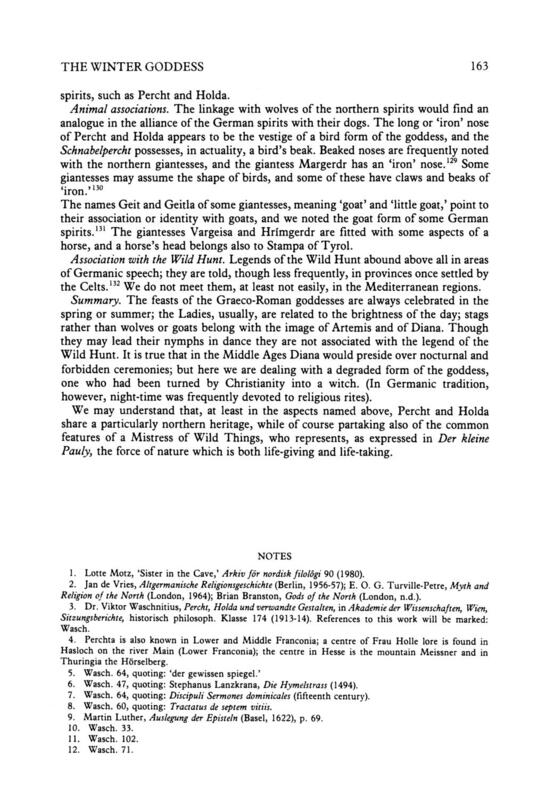 See ref H6fler, as in ref Canon Episcopi, in the version of Burchard of Worms, quoted by Jeffrey Russell, Witchcraft in the Middle Ages (Ithaca, 1972), p Wasch. 82, quoting: Thesaurus Pauperum of the Tegernsee Manuscript (1458). 46. Wasch. 103, quoting: Thom. Reinesius, Krit. Anmerkungen zu Rhyakinus. 47. Wasch , quoting Discipuli Sermones (1480). 48. Wasch. 87, this took place in Hesse. 49. Oswald A. Erich und Richard Beitl, Wirterbuch der deutschen Volkskunde (Stuttgart, 1974), entry: wilde Jagd. 50. Die deutschen Sagen der Briider Grimm, Dr. Hermann Schneider, ed. (Berlin-Leipzig, n.d.) I, Ortssagen, nr Wasch Wasch. 80; the distaff has to be empty by Christmas Eve. 53. In Poltringen in Swabia, Wasch Or flax may be wound around a girl's arm and then burnt off, Wasch Wasch. 78, Wasch. 89, Frau Holle in Hesse. 57. As in Salzburg, Wasch Wasch. 105, in Thuringia. 59. Wasch. 99, this happened in Neidenberge in the Voigtland. 60. It is called Polse and is eaten in Reichenfels, Wasch Wasch. 89, near the mountain Meissner, in Hesse. 62. Wasch. 24, in the M6lltal. 63. Wasch. 19, this happened to a lad in Styria in the night of Epiphany. 64. Wasch. 89, the well is near the Meissner and had earlier housed the unborn children. 16 166 LOTTE MOTZ the Penitential of Theodore of Canterbury, McNeill and Gamer, p. 41. 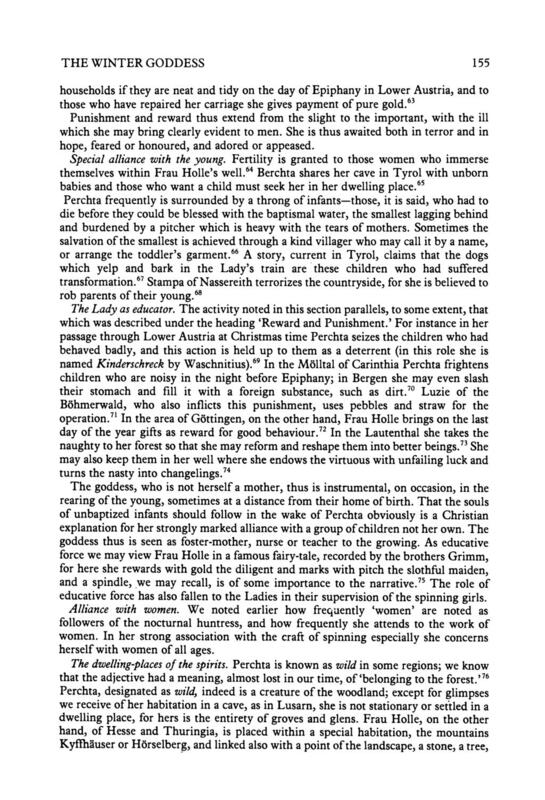 The rites are also condemned in a letter of Bonifatius to Pope Zacharias, Monumenta Germaniae Historica, Epistolae II, p. 30; in the Synod of Auxerre, Elisabeth Blum, Das staatliche und kirchliche Recht des Frankenreiches (1936), p. 34; the Synod of Tours, Karl Heferle and H. Leclerque, Histoire des Conciles (Paris, ), III, p. 191; the Synod of Rouen, Heferle and Leclerque, III, p It is true that some prohibitions may merely be a repetition of earlier statements; it is nevertheless clear that no other custom received so much attention from the Church. Other forbidden customs of the midwinter feast are the offering of gifts to rocks and wells, and customs related to spinning and to wool Nils Lid, Jolebanden og vegetasjonsguddom (Oslo, 1928), pp. 73 ff Jose-Maria Blazquez, Die Mythologie der Althispanier, in Gdtter und Mythen im alten Europe, Hans Wilhelm Haussig, ed. (Stuttgart, 1973), entry: Hirschkult. 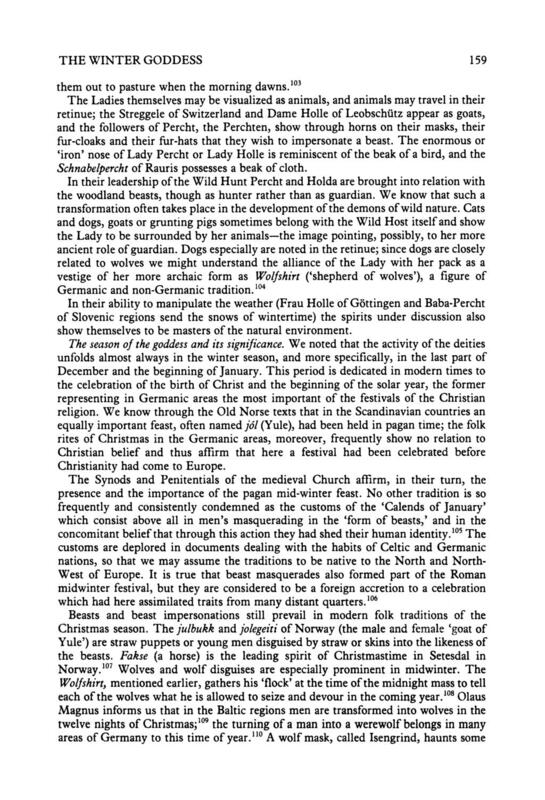 Mircea Eliade, Zalmoxis, the Vanishing God (Chicago, 1972), p. 14, speaks about wolf masquerades in the Balkans at Christmastime Michaele de Ferdinandy, Die Mythologie der Ungarn, in Haussig, as in ref. 113, entry: Regis Eliade, as in ref. 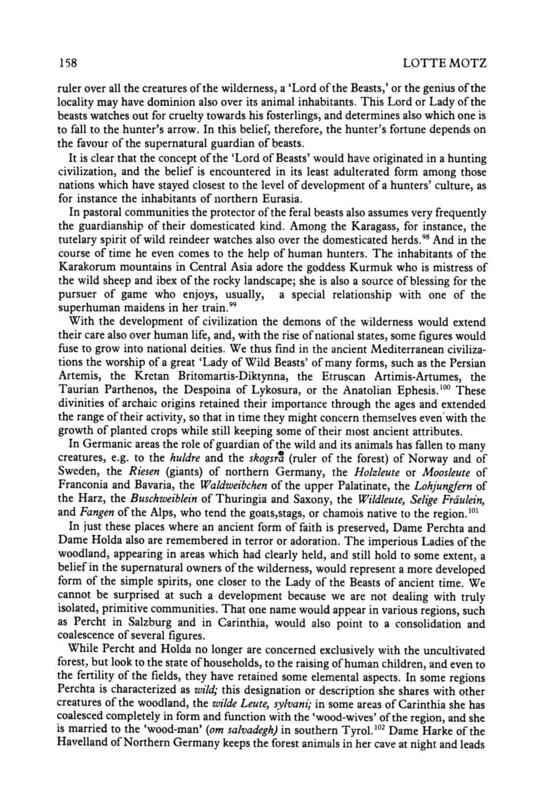 113, p. 15, speaking about the wolf masquerades of the Balkans: '... the original source of all these creations lies in the religious universe of the primitive hunter; it is a universe dominated by the mystical solidarity of the hunter and the game.' 116. As vividly and proudly described by Johan Turi, Turi's Book of Lapland, translated from a Danish translation by E. G. Nash (Oosterhout, 1968, repr. ), pp Mircea Eliade, Rites and Symbols of Initiation, Willard, R. Trask transl. (New York, 1958), p H6fler, as in ref. 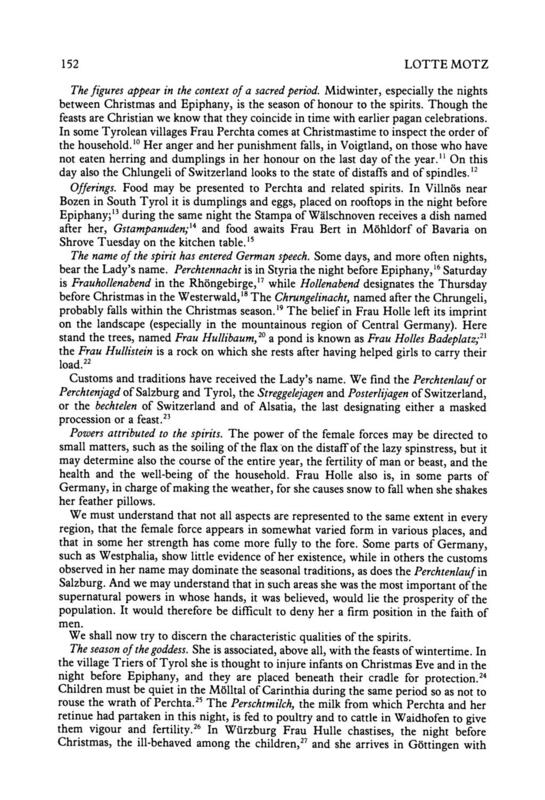 112, p. 46, note 162; in two German fairytales, recorded by the brothers Grimm, the opening and refilling of a stomach results in the rebirth of some creatures. The Wolf and the Seven Kids and Little Red Riding Hood Elmo Suhr, The Spinning Aphrodite (New York, 1969) Eliade, as in ref. 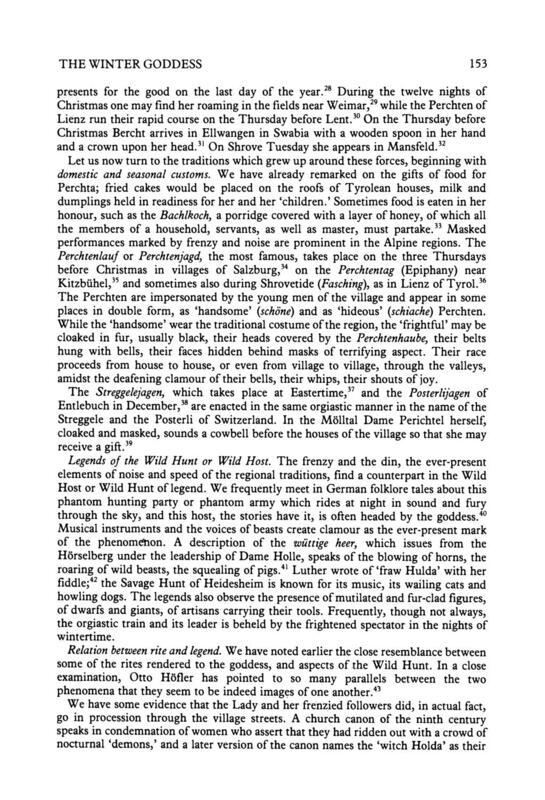 117, p. 46; Richard Wolfram, 'Weiberbiinde,' Zeitschrift fur Volkskunde 42 (1932), p Waldemar Liungman, Traditionswanderungen: Euphrat-Rhein, Folklore Fellows Communications 119 (1938), pp Grettis saga Asmundarsonar, ch The wolf may be called 'Steed of Jarnfaxa,' or 'Horse of Leikn,' Den Norsk-Islandske Skjaldedigtning, ed. Finnur J6usson, 453, 8, 4 and 149, 6, M6rn and Herkja appear in lists of giantesses' names Gylfaginning 12, in Edda Snorra Sturlusonar, ed. Finnur J6nsson (Copenhagen, 1931) Hversu Noregr byggdist, ch. 1, in Fornaldar sigur Norgurlanda, ed. Gujni J6nsson (Reykjavik, 1959), I Bdrdar saga Snaefellsdss, ch Grettis saga, ch. 65; ojstolfs saga hamramma, ch Hjdlmies saga ok Olvis, ch. 12. in Formalder sogur (as in ref. 126), IV A giantess changes into a crow in Vdlsunga saga ch. 2; Skinnhufa and Vargeisa transform themselves into vultures with iron claws and beaks, Hjalmfes saga, ch. 20, in Fornaldar sigur (as in ref. 126), IV. Rauris lies in the Austrian province of Salzburg; the Schnabelpercht also carries large wooden scissors to open the stomach of the evil-doer: Gerlinde Proier, 'Die Schnabelpercht geht nur in Rauris um,' Reiseland Osterreich (1, 1980), p Geitla appears in a list of names of giantesses, pulur, Edda Snorra, as in ref. 125; Geit is a figure of Jikuls fdttr Btasonar, Ch Legends of the Wild Hunt are found in northern, western and central France and are very rarely met in the Languedoc, the southern portion, Paul S6billot, Le Folklore de France (reprinted Paris, 1968) I, pp Only one story of the Wild Hunt is found in Katharine Briggs's collection A Dictionary of British Folktales (Bloomington, 1971). Key concepts: Authority: Right or power over others. It may be a person such as a priest, a set of laws, or the teachings from a sacred text. A sermon preached by the Dean on Sunday 5 th January 2014 The Fest of the Epiphany at the Cathedral Eucharist. Rome Lesson Plan 3: Religion in Politics and Daily Life Introduction: In this lesson, students will examine various aspects of religion in ancient Rome including the role of mythology, polytheism versus. Mysterious Plaques: Can You Solve the Riddle? Prayers for a Virtual Pilgrimage with Pope Francis Tuesday, September 22 Washington, DC As our shepherd Pope Francis begins his pilgrimage to the United States, please pray for the Church in our country. So the passage we hear from the Gospel of John this morning turns out to be a meditation on the death and resurrection of Jesus. The story of David and Goliath has captured the imagination of God s. David. Overcoming Giants דוד. Lesson One: Lesson Objectives.